Social-minded e-commerce merchants have been waiting for this day. 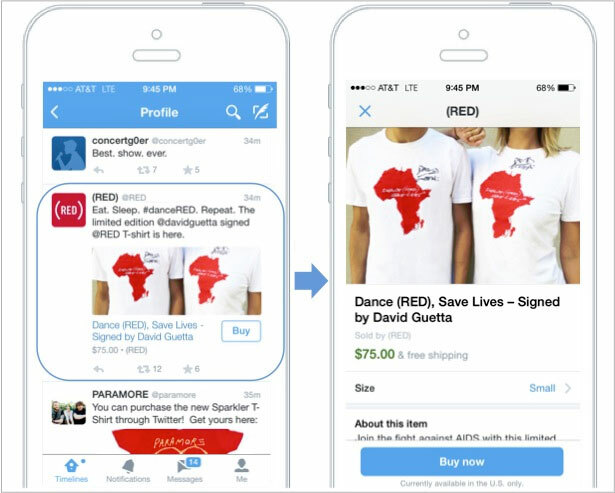 Twitter just announced that it is officially testing a "Buy Now" button which will enable users to purchase from select merchants and musical artists directly from the social network's stream. The Twitter Buy Now button will only be available to a select group of users before being introduced more widely in the coming months - as in "just in time" for the holidays most likely. Brands including Burberry and The Home Depot, and artists like Ryan Adams and Megadeth are some of the first to test out this relatively major development in the e-commerce space. We were unable to find any actual examples of the Buy Now button in the wild however. If you happen to find one, let us know in the comments section. Twitter has partnered with companies including Fancy, GumRoad, MusicToday and Stripe for the initial test and indicated that more partners will follow soon. So how does it all work? Twitter Group Product Manager Tarun Jain explains. "In our test, an entire purchase can be completed in just a few taps. After tapping the “Buy” button, you will get additional product details and be prompted to enter your shipping and payment information. Once that’s entered and confirmed, your order information is sent to the merchant for delivery."